In the aftermath of the arson attack on the Islamic Society of New Tampa, the outpour of support from the community at large was massive. We received messages of support, offers of help, and monetary donations from over 2,000 different individuals. As a small token of our appreciation, we extended an invitation to our local supporters to join us for a hearty lunch. And so on Sunday, March 12, a group of our allies came to the mosque to break bread. Members of the community engaged in meaningful conversation with our friends and neighbors as they delighted in an assortment of shawarma, falafel, hummus, and baba ghannouj, while their children played blissfully on the playground. Imam Junaid, mosque spokesperson Mustafa Ameen, City Councilman Luis Viera, and a representative from Action Together Tampa Bay all took turns addressing the crowd. Many of the visitors toured the mosque facility as well. It was truly a remarkable event. The Islamic Society of New Tampa remains committed to building bridges and establishing relationships with the friends and allies of the Muslim American community in the greater Tampa Bay Area. In so doing, we hope to ensure a safer, more united community for us all. A reflection on last year's open house. “Can I pray with you?” asked Joshua an attendee at the Masjid Open House. 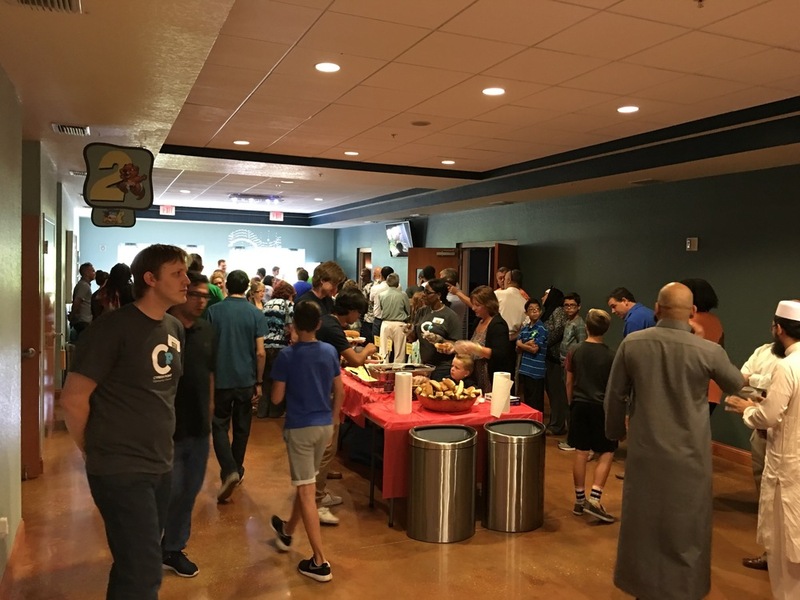 A member of the St. Petersburg Jewish community, Joshua learned about the open house and brought his 6-year-old daughter to show her the Mosque. He stood beside his new friend Hamid, one of our Masjid volunteers, during the Dhuhr prayer and emulated the moves of the other worshippers. It was a sight that reflected the openness and acceptance that each one of the visitors would express that day. 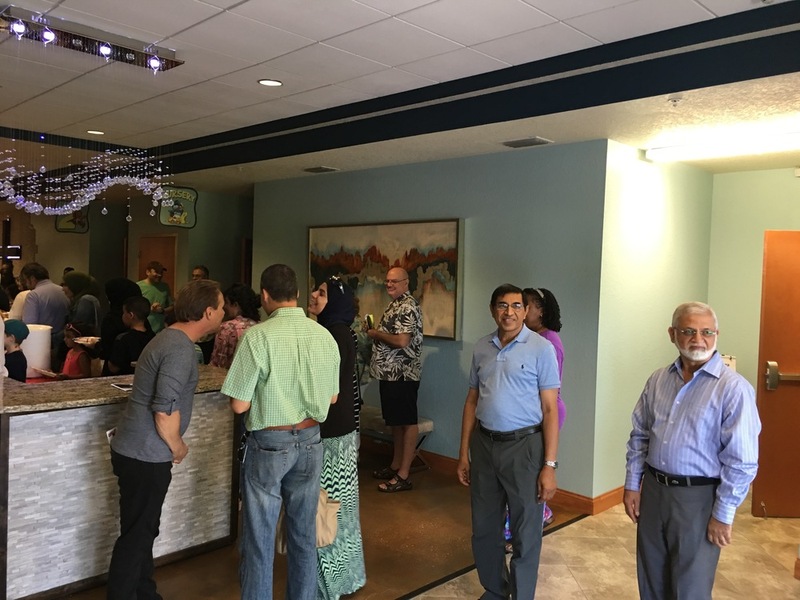 Non-Muslims – Jews, Christians, Hindus and Sikhs alike – thronged the New Tampa Masjid to attend our Open House on October 23, 2016. “Our doors are open!” proclaimed a flyer inviting the community to the event. In the throes of election fever and strong rhetoric that comes with it, the air was palpable with intrigue and inquisitiveness among the visitors. “I did not know that Islam revered Jesus so highly,” quipped a Christian attendee. Another attendee from a nearby church congregation hugged a volunteer and said, “Thank you for opening your doors for us – we had a lot of misconceptions about Islam and Muslims”. As the guests kept pouring in, volunteer were seen providing a guided tour of the Masjid. They explained the centrality of the Masjid in a Muslim’s life as a place of prayer, as well as a center for spirituality and community. They translated the Quranic verses written on the walls and talked about the history of the Masjid and its architecture. Dr Khan, a volunteer, sat with a group of older visitors, as he explained to them the basic tenets of Islam, especially the five daily prayers, while the Adhan was being called. The visitors watched in silence as the worshippers stood up for the Dhuhr prayer, taking note of the order and formation that replaced randomness as soon as the Iqamah was called. After the prayer, Imam Junaid explained the method of the Salah and its spiritual significance in the life of the Muslim. The visitors were ushered into the exhibits and poster gallery by the volunteers. They had an opportunity to browse posters and educational materials from Discover Islam that describe common Islamic beliefs and also address common misconceptions about Islam. The ladies loved the Henna station as well as the room full of ethnic wear that was being displayed by sisters of our community. Some visitors took the time to chat with our resident experts after they were done touring the Masjid and browsing the different exhibits. Sister Danielle and Br Shakeel provided in-depth answers for a variety of questions posed by the visitors. The tour of the Masjid was capped with a splendid lunch prepared by the community members. The guided tours, the exhibits, and the one-on-one attention provided by the volunteers and community members all made for a very cordial and friendly experience for our non-Muslim guests. 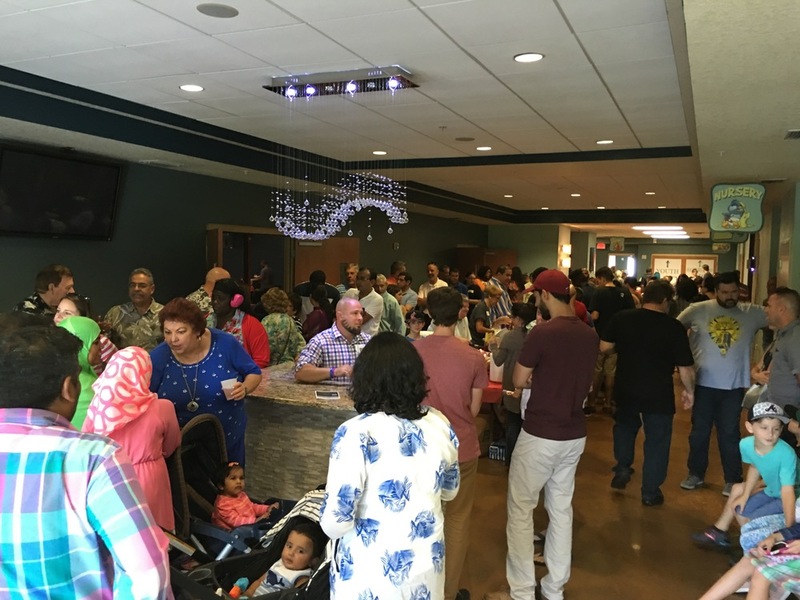 The Open House met its goal of showing our neighbors that a Masjid is a simple place of prayer, attended by common folk who have common every day struggles and strive to have a positive impact on our community and the country. It helped debunk stereotypes and opened up hearts and minds. Overall, it was a very pleasant and heartwarming day for everyone Alhamdulillah. The community members and volunteers yet again rose to the occasion and showed their openness and dedication in organizing this successful event. In this upcoming year full of challenges and opportunities, we look inwards to our community for the strength and outward to our neighbors for the support we need to thrive and build a better Tampa and a better America. May Allah help us and guide us towards a successful and bright future. A future where complete strangers like Joshua and Hamid are able to share a moment of appreciation and gratitude for each other, and for each other’s faith. Aameen. Building on Faith. 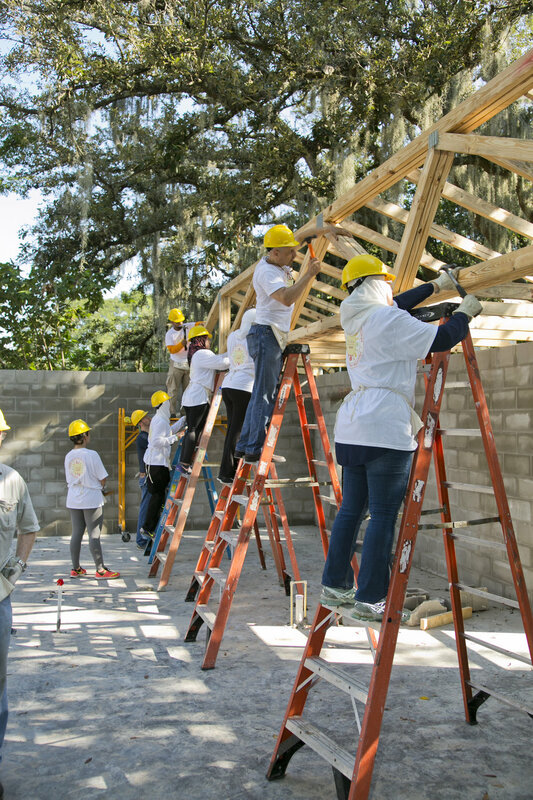 This was the theme of the Habitat for Humanity “Raising the Roof” project a group of Islamic Society of New Tampa volunteers partook in on Saturday, September 24. 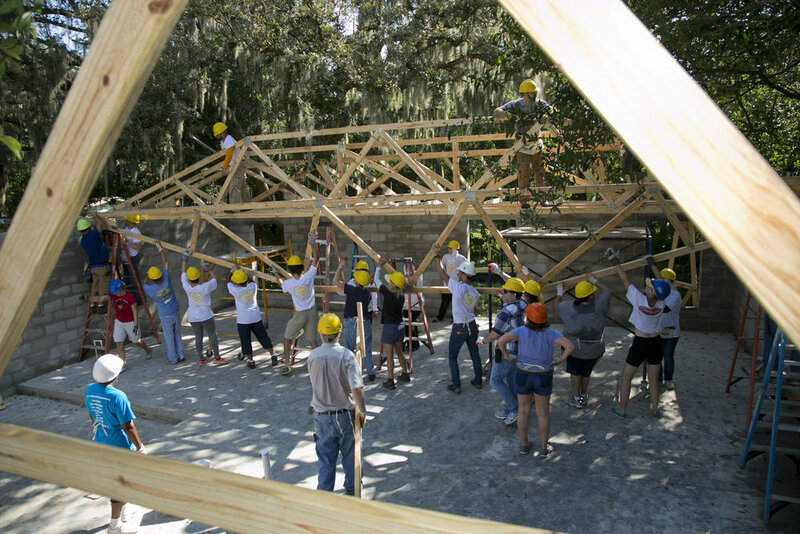 Working hand in hand with members of Congregation Schaarai Zedek, Hyde Park United Methodist Church, and Lifepoint Church, they helped assemble the roof on a home being built for Margaret Brown, a retired Hillsborough County schoolteacher who was the fortunate recipient of a “hand up” from Hillsborough Habitat. The group gathered in prayer, with the sun’s glorious rays slowly creeping up from behind the concrete structure that had already been assembled. 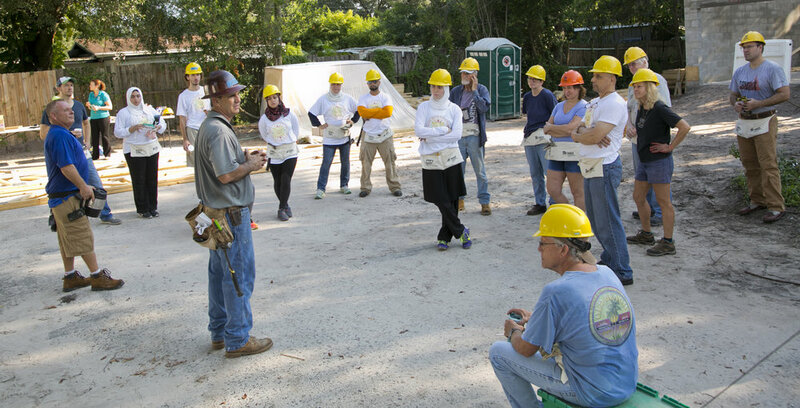 Ronald E. Spoor, CEO of Hillsborough Habitat, started off by quoting the verse from the Holy Qur’an that states, “Whoever saves a life, it is as if he saved mankind entirely,” and then quoted equally inspiring passages from the Torah and the Bible. The beauty of this moment lay in the sense of unity it evoked – though the volunteers subscribed to a variety of religious traditions, they were all mindful of God’s blessings on them and the role He played in making Ms. Brown’s dream a reality. The project for the day was to quite literally raise the roof of Ms. Brown’s home. In essence, this entailed installing wooden trusses that would eventually form the basis of the roof under which she would live. The Habitat contractors had a diagram in hand, and they split the group of thirty or so volunteers in two: the “floor crew” and the “ladders and scaffoldings crew.” It took a couple of rounds before everyone found their rhythm. The floor crew would join forces to carry a massive truss into the building, where they would then lift it and roll it up to the people on the scaffoldings. More volunteers would scurry up the eight-foot ladders, hammer and nails in tow, to then stabilize the truss. This undertaking was quite onerous, given the size and weight of each truss, the narrow quarters, and the scorching heat. But soon enough, all the volunteers – novices and experts alike – knew exactly what to do without much added direction. In just a matter of hours, all the pieces were up and the roof had taken tangible form. 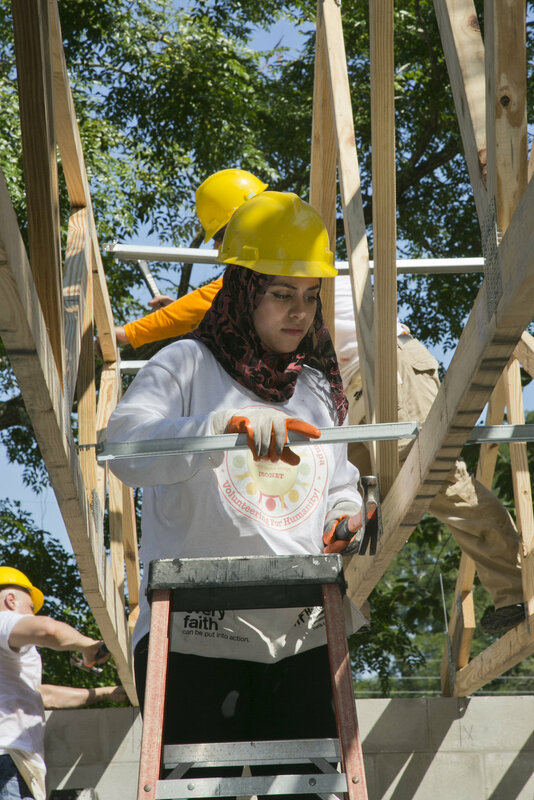 The interfaith build was an immensely gratifying experience, on multiple levels. United by a common goal, the ISONET volunteers and their Jewish and Christian comrades worked tirelessly to achieve the goal they set out to accomplish. It served as a reminder that God has called upon us all to give back, not just within our own insular communities, but also to the community at large. Ms. Brown’s excitement was priceless, and she was truly appreciative of the individual volunteers who devoted their Saturday to help her achieve the affordable housing that Habitat for Humanity made possible through its noble efforts. 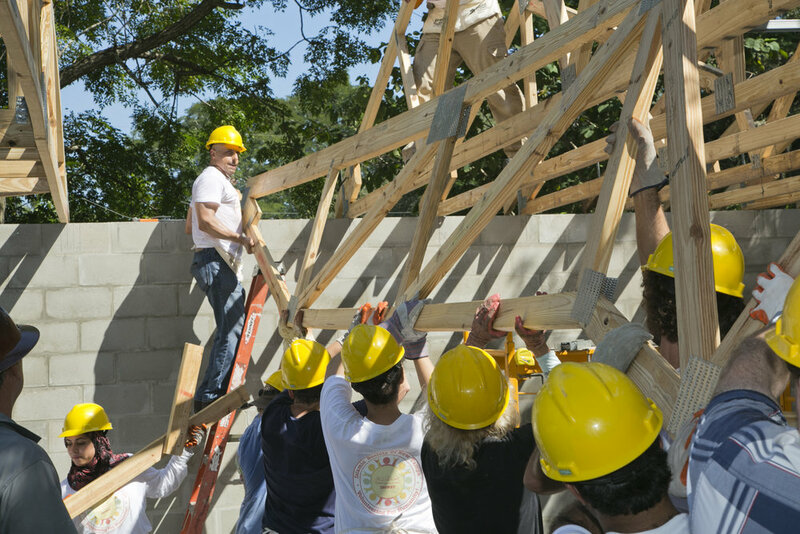 Hillsborough Habitat is eager to have more volunteers assist in its various ongoing projects. ISONET intends to arrange periodic building trips over the course of the next year and will reach out to the community for volunteers, inshallah. "آللہ تعالی حدوں سے گزر جانے والوں کو پسند نہیں فرماتے۔"
Anger drains the energy out of a person and makes them unable to think of anything else. They are unable to think about what they are saying or whether they hurt those around them. They can not understand the kind of effect they leave on others in their anger. Anger deludes a person into justifying their actions and will cause them to do anything to make their argument correct. Anger also reveals a person's ego as they cross their limits. "Allah doesn't like those who cross their limits ". Essentially, Shaitaan is humankind's biggest enemy by making a person weak through their anger that leads to bad deeds. Words, words, words, funny example sentences, interviews, museums, drama, odd words, correct spellings, applause, never heard of words, bell rings, hard work, perseverance and standing ovations. That’s my one-sentence summary of the Scripps National Spelling Bee. First of all, I would like to thank Allah (SWT) for all success and for giving me an amazing family and a very supportive community. It was a tremendous honor to represent Bayaan Academy first at the regional spelling bee and then on the national stage. Alhamdulillah, I was blessed to have gained a one-of-a-kind experience at this year’s Scripps National Spelling Bee. For the first time in my life, I was out of my comfort zone, I met new people, made new friends and shared common interests. It was quite amazing. The 285 kids who took part in the Bee weren’t competing against each other. But rather, we collectively fought against the dictionary. This experience has helped me to become more calm and collected under pressure. It has inculcated in me a deep thirst to push myself to accomplish the impossible. It has taught me to set unrealistic goals, to dream of the impossible, and to work hard to make them happen. At this assembly of enlightenment, I learned some lessons that I would like to share with you. First, to do great things, one must surround oneself with others striving for excellence. When surrounded by this group of well, let’s just say, nerds, I felt an urge to do better. I already wanted to start reviewing for next year’s Bee and was eager to memorize the roots of words and the dictionary itself all of a sudden. That’s why I believe that we need to work on building a new culture deeply rooted in excellence, to think big and to achieve in both dunya and aakhira. Allah SWT has bestowed great intellect upon each one of us. It’s all about putting it to the right use – channeling our minds to do more. Think of anything that you are passionate about, and try to reach its pinnacle. It is important to remember this hadith: “Verily, Allah loves that when anyone of you does a job, he should perfect it." (Al-Bayhaqi) Though Allah alone is perfect, we should strive for perfection in all of our endeavors. Have you ever been in a situation where you keep allowing people to hurt you, and even though you promise yourself that this time will be different, it almost always never is? Why does this happen? It happens because we give people expectations that they weren’t meant to carry. People are inherently good, but they are also prone to mistakes, and shortcomings. When something bad happens, we are quick to get mad at people--instead of looking deeper at ourselves and Allah’s role in it all. Of course, if people do something that isn’t just, they need to be held accountable, but at the end of the day, how do we deal with the emotional side effects of the bad things that happen to us? Do we decide to hold grudges against the people who wronged us, or do we use it as an opportunity to grow and figure out what Allah is trying to tell us? The second option is the best for our personal growth, and, more importantly, our ultimate salvation. I have a personal story that very much relates to the topic at hand. My sister is disabled and she has often felt very out of place in some masajid because she doesn’t wear hijab due to her epilepsy--and a lot of sisters--not knowing any better and just trying to help--ask her to wear hijab--sometimes nicely, and other times not so nicely. I always let them know that she can’t wear hijab due to her disability, and they are usually very understanding, but it doesn’t change how my sister feels when these ladies who do not even know her sometimes approach her with a rude tone. Why does this matter? About two weeks ago, I was at the masjid with my sister, and this young girl with down syndrome came inside and literally raced toward my sister. She's never met her before. The girl's mom came over and tried to pull her away saying that her daughter always disturbs people. I looked her in the eyes and told her it's okay, that my sister has special needs too, and she can play with my sister and rest on her as much as she likes. I know that this event was as much a sign for my sister as it was for me, because I have avoided the masjid for feeling like I don’t belong at times too. Allah was showing me, literally, that if I come to His house for His sake--He will provide a way for me and my sister to feel like we belong. That sign was shown to me so plainly, and so beautifully, that I knew for a fact that it was straight from Allah. As Muslims, we need to give each other more excuses when we make mistakes and realize that no matter what, if we come to Allah, He will always have our back. It’s when we forget who’s really in charge that we feel so much unnecessary pain. If we want to stop giving people the power to hurt us, we have to realize that they are not in control. 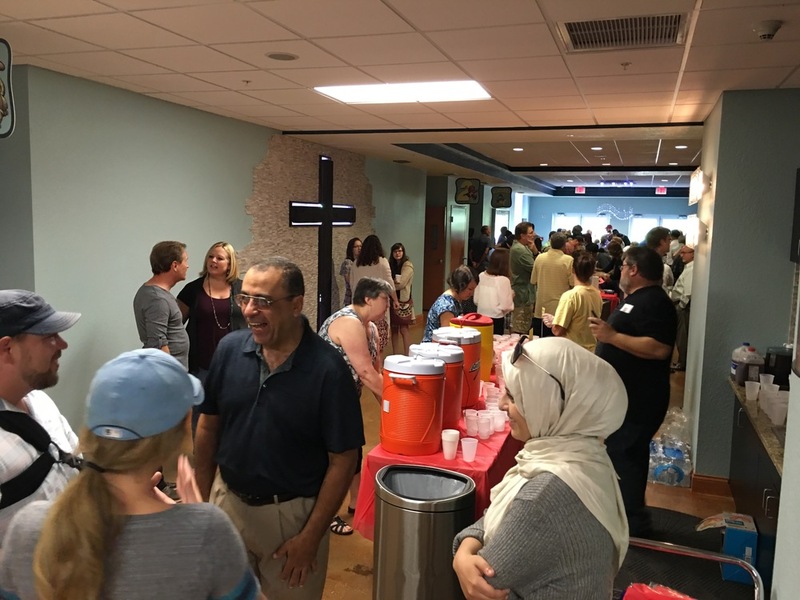 Our friends at Cypress Point Church helped us welcome the month of Ramadan by delivering water bottles to satisfy the needs of the mosque-goers at Iftar, and again renewed the kind gesture in the aftermath of the Orlando shooting. We are fortunate to have found allies in our neighbors at the church. Ever since we developed a relationship with them, and particularly over the course of the last year or so, they have showed us nothing but kindness and support. Cypress Point Church is a beautiful reminder of the interfaith spirit and genuine respect that allow us to live harmoniously with one another. We are truly fortunate to call them our neighbors. Having lived in this community for over 25 years, I have seen many people come and go. I have bid farewell to people who have moved to different cities, states or countries, and I have bid farewell to people who have departed from this world into the next. Each person who has departed has left his or her mark on the community and on our hearts. In this past week, we lost two very dear members of our community, one to illness and the other to an accident; one was older, the other was a young man, rahmatullahi alayhim. Such has been the case almost every week of every month over the past years. At the same time, I have witnessed just as many weddings, births and graduations. The sadness of loss is always offset by the pure joy of blessed events and successes. Such is the cycle of life. Having lived in this country for almost 50 years, I have been witness to the many changes that the Muslim community has gone through over the span of almost half a century. As new immigrants to this country, we were often the only practicing Muslim family in the small towns where we lived. As we became teenagers, we were definitely the only hijabis in our schools. We reveled in the successes of Mohammed Ali in the early 70's and were thrilled that he had brought the name Mohammed into common conversations; after him, rahmatullahi alayhi, other prominent Muslim athletes helped make our names - Ahmad, Ismail, etc. - common names in the Western world. We lived through the Iran Hostage Crisis, when we were harassed and told to go back to our country, even though we were not from Iran. And, of course, we lived through 9/11, one of the most tragic events to touch the US, after which no one would feel the safety and security that we had felt growing up in this great country. We began to see the growth of Inter-Faith Dialogues and Hijabis in both the White House and in Target commercials; we had gone from being on the fringe to being mainstream. Mainstream, however, is not where some members of this society want to see us. No matter how mainstream we become, no matter how positive our impacts are on the society, there are some who make it their goal to paint us as "radicals" and "anti-American." We ARE American. We do not understand or accept the oppression and tyranny that exists in the countries whence our parents came. We ARE Muslim. We have been raised with our Islamic values without the cultural baggage that can very easily wear Muslims down and put a distance between them and their deen. Masha'Allah, our community is a vibrant, loving and productive community, a community that we must cherish and grow. We must know, with every fiber of our bodies, that, no matter how much negative media attention we get, we are way ahead of where we were 40 years ago. Subhan'Allah, after the tragic killings in Orlando, there was much discussion on Facebook about Muslims and the Qur'an. I was amazed by the number of Christians defending Islam and making it clear to the detractors that neither Islam nor the Qur'an condone the mass killing that took place. We have made progress. We must continue to make progress. We must continue to get to know our neighbors and be good neighbors. At the same time, we must be vigilant, and we must keep in mind that, though they are the minority, there are those that would like to hurt us. At our masajid, we must support the efforts of our community-members to provide enhanced security, and we must be grateful to them and stand by them. This is our community. This is our country. This is our history. This is our now. the most purest form of You. Those of us who grew up in a country with Muslim majority remember how Ramadan had a special respect by all citizens. Restaurants and coffee shops would close during fasting hours and those who did not fast, Muslims as well as non-Muslims, refrained from eating, drinking, or smoking in public. The entire atmosphere would tell you that this is Ramadan! I still remember Akram, a Syrian Christian, who spent a university summer camp with me along with many other classmates in 1977. Ramadan came in while we were in the camp. Akram refused to eat or drink in front of us despite our pleas with him to do so since he was not a Muslim. When he felt hungry or thirsty, he would sip or nibble in an isolated place so he won’t be seen eating or drinking in front of us. At sunset time, he would sit with us to share the iftar meal with us. This story was the norm, and not the exception in Syria and other Muslim-majority countries. It brought people from different religions closer together. Muslims also respected the Christian religious events and shared the joy with their Christian neighbors. Fasting in Ramadan is one of the obligations on every adult Muslim who is able to do it. However, what makes fasting different from other acts of worship is that all acts of worship are actions while fasting is abstaining from certain actions. This is why only Allah knows if the person is truly fasting or not. Fasting is a personal thing; a matter between the individual and Allah. In a Hadeeth Qudsi, Allah says: “All of the deeds of the son of Adam are his except fasting, it is for me and I am the one who rewards it.” But people have the choice to obey or disobey (And say, "The truth is from your Lord, so whoever wills - let him believe; and whoever wills - let him disbelieve) (The Holy Quran, 18-29). Of course, this freedom comes along with responsibility and consequences for the choices we make. No one has the right to force others into fasting or praying but respecting the atmosphere of Ramadan is a must on every Muslim. That’s why Muslim scholars said that even those who have permission not to fast, such as travelers and ill people, should avoid eating and drinking in public. But that’s in Muslim countries not here in the U.S., right? Right, we have no right to force our culture on others. We realize the fact we are a small minority but there are two things we can do. First, we uphold the “Ramadan atmosphere” in our homes and small communities where we have control. We teach our kids that it’s not okay to disrespect or ignore Ramadan. Second, we convey the message of Ramadan, and Islam in general, to the bigger community. We tell them about our great religion and that we share a lot of values. If we are invited to an event where food and drink are served, we politely inform that why we can’t eat or drink before sunset. We take advantage of Ramadan to tell them what Islam is all about. Whenever there is a seminal or portentous event, an event that holds personal significance for an individual, they spend a significant amount of time preparing themselves for it. If a person has an interview for Google or a top tier university, they will spend a lot of time getting ready for the interview. He or she will research what is asked in this type of interview, prepare their potential answers, anticipate what type of questions may be asked, and rehearse their answers. The night before the big interview, they may not even be able to sleep at night out of worry-- their minds full of the various possibilities that tomorrow holds. If a person does not prepare, then they will simply look like a fool on the day of the interview. In the same way, if someone wants to hold a graduation party or a wedding, there are usually months of planning that precede the actual event. If there is no planning, then the graduation or wedding instead of being a cause of celebration will become a cause of embarrassment. The reason that planning and preparation are important is that without them, the event is bound to be a marked failure. We must then ask ourselves what is a more important event than the month of Ramadan, the month of the Quran. Do we want to look like a fool, to be embarrassed before Allah SWT in this month? This is the month in which a sinner can become a saint. This is the month in which the mercy of Allah rains down upon His creation. This is the month in which the Creator of the universe releases people from the shackles that they have placed upon themselves. This is the month in which people are removed from the fires of hell and placed into the gardens of paradise. Because of the great blessings that exist within this month, the one who is deprived of the benefits of this month is truly unfortunate. Understanding the importance of this month, it has been said that the Sahabah (R) prepared six months for Ramadan and then afterwards spent six months worrying whether or not their actions performed in Ramadan were accepted. This is one of the reasons that we do not benefit from this blessed month. Since we treat it like any other month of the year due to being too busy with life, Ramadan comes and goes and we do not take any particular benefit. We exit the month in the same way that we entered it. If we had prepared this would not be the case. Take for example a old car that is driving along the road. Even if there is a Lamborghini parked at the stoplight, if the old car is already driving at 50 mph at the time that the light turns green, it will still beat the Lamborghini. For many of us since we have not prepared for Ramadan ahead of time, and by the time we “get into gear,” the month is almost over. How does one prepare for the month of Ramadan? They are both practical and spiritual things that should be done in preparation for this blessed month. The first thing that we should do is become accustomed to leaving sin. Sin serves as an anchor for spiritual progress. Fasting is a shield as long as one does not tear it or destroy it. What can be more foolish or ignorant than a slave disobeying his master, than thecreation disobeying the Creator? Common areas where people fall into disobedience include television, Internet, music, backbiting, taking interest, or transgressing the rights of others. One should try to rectify any wrongdoings made against another person by asking their forgiveness before this month starts. This is the time to “bury the hatchet.” This allows a person to enter into the month disencumbered. A heart that is clean toward his fellow man is indeed a beautiful slate on which to write the story of their Ibadah in Ramadan. It is important to get into the habit of fasting before Ramadan actually begins. This conditions the body and soul so that it is not shocked by the advent of Ramadan. Fasting in Shaban was the beloved Sunnah of the Messenger (S). Like any other thing that is important, doing it right takes time and effort. This becomes more difficult if we have other competing responsibilities and tasks. The wise person is the one who tries to take care of as many things as he or she can before this blessed month actually starts. This frees up more time so that a person can concentrate on their worship and on their Creator. Take care of the term paper that you have been putting off. Trim the bushes and make that home improvement that has been on your to do list for a while now. Put the bills on auto pay. Do Eid shopping ahead of time. Make a rule that you will check email only once a day. Less things to worry about means more time for Allah. Also if at all possible a person should try to schedule some time off during the last 10 days of Ramadan. During this time a person should go into seclusion in the Masjid and try to reconnect with their Lord. Making Itikaaf was the sunnah and Habit of Rasulullah (S). Abu Hurairah (RA) said: “The Prophet (PBUH) used to observe Itikaf in every Ramadan, for ten days. During the year in which he died, he observed Itikaf for twenty days.”(Hadith No. 2466, Book of Fasting, Sunan Abu Dawud, Vol. 3). A sample schedule is provided below. We should practice trying to get on a schedule in Shaban itself, so we can hit the ground running in Ramadan. One of the mistakes that people make is that they stay up late at night instead of going to sleep. This throws off the schedule the entire next day and compromises the benefit that one can derive. In the end, we are weak and need that succour of our Lord to help us in this life and the next. Without His love and His help, we are lost. We should ask him to rectify our affairs in this month of Shaban and to benefit us from the month of Ramadan by making it a life changing experience. Ameen. The school year is quickly coming to an end, and, if your children's school is anything like my school, things are going to be very busy the next few weeks. Then, just a few days after the last day of school, Ramadan will begin. Subhan'Allah, when my kids were young, and I tried to keep them actively engaged in the summer, they would whine, "But, Mama, it's summer vacation!" "Yes," I would reply, "it is Summer Vacation. It is a vacation from school, not from life." It is very important to me, as a Muslim and as an educator, that children and teenagers stay active and engaged throughout the summer. The two and a half months should not be spent sleeping until noon, then lounging around and then staying up late at night. Their minds and bodies need to stay engaged throughout the summer, so that when Fall rolls around, they are not totally unprepared for school. Again, Summer Vacation is a vacation from school and not from life. Remember, Allah SWT will hold us accountable for all of our days and for all of the hours in each day; He does not stop keeping track of us during the summer. If you are not sure what to do with your kids over the summer and/or how to keep them actively engaged, there are so many web-sites with information for you. The easiest two things to Google are: (1) Kids Summer Activities in Tampa; and (2) Kids Ramadan Activities. For the first search, not all of the activities will be appropriate for Muslim children, so you, as a parent, will need to go through them and see what would be interesting to them and acceptable Islamically. Subhan'Allah, I did a very quick search and found many places/activities that I was not even aware of in the Tampa Bay area. For the second search, you will find a wealth of Ramadan activities for all age groups that both boys and girls will enjoy and benefit from. If you have teenagers, you may want to direct them to volunteer service at any one of many non-profit organizations in Tampa. Most of them can earn valuable Community Service Hours towards National Honor Society/National Jr. Honor Society and graduation requirements, while gaining fulfilling experience serving their community. For all of the activities, you can choose to enjoy them as a family, or you can enjoy them in groups. Remember, most places offer discounts for groups of 15 or more. Of course, throughout the entire summer and with everything else you plan, you must include the Masjid in your plans. In Ramadan, that will be easy, as many of you will take your children with you to Iftar, Taraweeh and Fajr. Try to keep the daily connection with the Masjid even after Ramadan and try to commit to praying at least one prayer there per day with your children. In addition, you have to include READING in your summer programs. If your children do not have Library cards, this is a good time to get them one. Your local library will have many summer activities for kids. Also, Barnes & Noble has a Reading Marathon that starts June 4for students in grades 1 - 6. Google it for more information. If you are not sure about what books your children should be reading, ask their teachers for Summer Reading Lists. [Have you seen the new book: It's Ramadan, Curious George?] If your children are in the public school, please make sure to read the recommended books before directing your children to them; they may not all be appropriate for Muslim children and teens. You can also go to https://www.commonsensemedia.org/ to find out if a book is appropriate for your child to be reading. If you will be traveling over the summer, engage your children in the history of where you are going and in the current events that surround that place. Every hour of every day can be a learning experience. My final words of advice: ENJOY your children over the summer. They are so precious, and they grow up so quickly. Make use of the extra hours that you can spend with them each day and cherish them will all your heart. ضرورت یہاں اس بات کو سمجھنے کی ہے کہ ہر انسان اپنی جگہ ایک مکمل اپنی مثال آپ ہے، کاش کہ یہ بات انسان سمجھ سکے کہ وہ خود ایک مجسم بنایا گیا ہے، اب وہ اپنے آپ کو خود جتنا بنا لے یا جتنا بگاڑ لے، یہ اختیار اس کے اپنے ہاتھ میں ہے!